JemStar Construction completed a 530 square metal roof restoration over 2 corrugated metal roofs at CMI Logistics LLC, a leading intermodal distribution company in the metals industry. The corrugated metal roofs had a mineral cap sheet attached to them that was completely deteriorated to the point that it was falling off the roof surface. 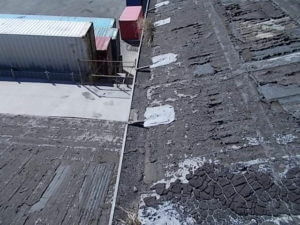 The exposed deteriorating asphalt roofing suffered from abrasion and was delaminating entirely. Beneath the built-up roofing materials, the metal roof was also being damaged, creating rust at penetrations, panels, lap joints and fasteners in various places throughout the roof. Leaks were entering the metal roof at the attachment screws and lap joints. The leaks began to rust and damage the structural steel supports of the building and the rain gutters were full of the deteriorated asphalt roofing and rusted beyond repair. 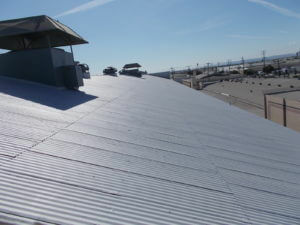 The annual roof maintenance inspection in August of 2015 reported that the roof was still serviceable but only if the loose cap sheet was removed, fasteners tightened and sealed and the metal surface treated and sealed with the SureCoat Roof System. By September 2015, Alden Management had a proposal from JemStar Construction and by January 2016, the metal roof restoration was underway. In preparation for the installation, JemStar Construction first installed 575 lineal feet of safety lifeline in the ridge of both the metal roofs that the construction crews were going to be working on. Next, the rusted and damaged rain gutters at the exterior perimeter of the building were removed and scheduled to be replaced with new custom metal rain gutters toward the end of the project. The roof was scraped to remove the existing deteriorated mineral asphalt cap sheet roofing materials. Then the roof was scraped again and cleaned to remove the loose and peeling adhesive and roof mastics from the corrugated metal roof panels. The prep work on this roof included checking and tightening all of the roof fasteners. All broken or damaged fasteners were replaced as needed. 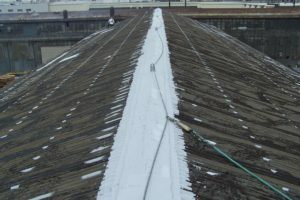 Then all roof fasteners were cleaned with a wire brush or wire wheel and SureSkrub was used to remove dirt and grime. The loose roof panels and flashings were also fastened as needed. The JemStar crew then cleaned and sanded the rusty metal flashings and inspected the remaining roof panels addressing splits, cracks and rusted areas. Once the metal roof repairs were completed, the crew cleaned, prepped and sealed the metal equipment curbs in the center of the building’s structure. A rusty metal primer was first applied to rusted areas of the metal surfaces. 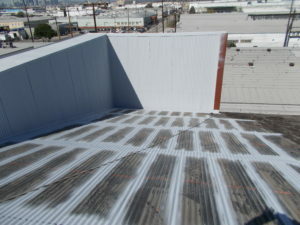 The curb to roof connection was sealed with SureCoat and Poly-Mesh; adding a finish coat of SureCoat to create a 4-ply coating repair to this area. SureCoat and Poly-Mesh were then applied to all roof penetrations and roof flashings to prevent cracking in preparation for a complete metal roof restoration. SureCoat and Poly-Mesh were also used at visible cracks and splits to repair the metal. All fasteners and screws in the roof surface were pretreated with a dollop of SureCoat and then sprayed with a basecoat of SureCoat covering the fasteners and lap joints throughout the field of the roof. Once these areas were dry, a basecoat of SureCoat was applied to the entire metal roof surface at a rate of 2 gallons per 100 sq. ft. The following day, a topcoat of StrucSureCoat in storm Cloud gray was applied at a rate of 1 gallon per 100 sq. ft. These restored metal roofs now have a 10 year renewable manufacturer’s performance warranty. These roofs can easily be renewed in year 10 for a portion of the initial installation cost and the warranty extended for an additional 10 years. SureCoat adheres to all types of metals including factory-coated metal, galvanized, bonderized, mild steel, sheet metal and aluminum. 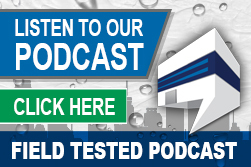 SureCoat can be used to seal and recondition exposed HVAC ducts, plenums and flashings to stop rust, increase energy savings of the HVAC and to waterproof these problem areas. SureCoat forms a seamless, protective, waterproof membrane that moves with thermal cycles and stops oxidation to metal. Without moisture and air, the oxidation process is interrupted so rust no longer forms on the metal. SureCoat is a cool roof coating with exceedingly high energy efficiency that lasts! 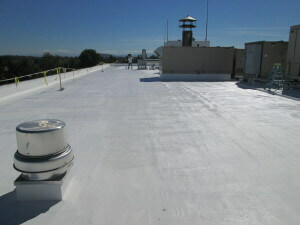 Unlike many roof coatings, SureCoat retains almost all of its original values even after years in service. SureCoat has a total Solar Reflective Index (SRI) of 111%, emitting 93% of heat back into the atmosphere and reflecting up to 88% of the suns damaging UV rays. To learn more about the SureCoat Roof System for metal roof restorations, call or click today 877-823-7873 – www.surecoatsystems.com.